The Rcpp package provides a consistent API for seamlessly accessing, extending or modifying R objects at the C++ level. Rcpp supports implementing R functions in C++ for high performance computing and to easily interface R with external libraries. If you don't already have these tools installed on your system please consult the article on Package Development Prerequisites for additional details on how to install these dependencies. 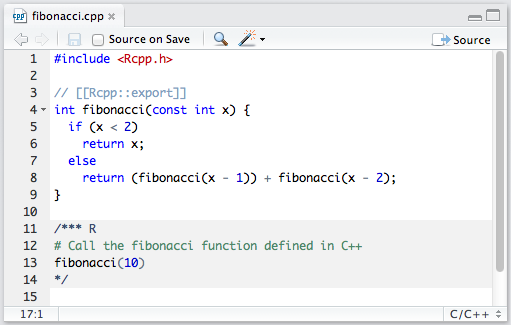 Rcpp versions 0.10.1+ include several features that make it very easy to write R functions in C++ and use them seamlessly in interactive R sessions. These features make use of Rcpp attributes, a high-level syntax for adding annotations to C++ source files. With Rcpp attributes it's possible to write C++ functions and then source them just as you would an R script. The Rcpp attributes vignette contains more detailed documentation on using attributes. The RStudio C/C++ editing mode makes the same Source command typically available for R scripts available for C++ source files. You can access this command on the editing toolbar or using the Ctrl+Shift+Enter keyboard shortcut. 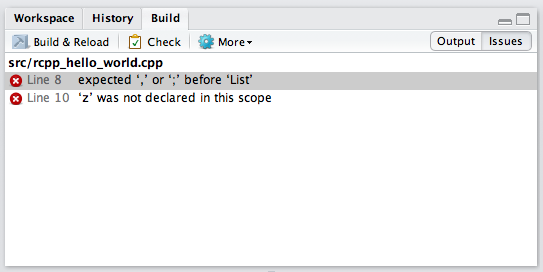 Note that you can also check the Source on Save option to automatically source the C++ file every time it is saved. This variation will keep the keyboard focus within the editor whereas the Source command will move focus to the console. Typically C++ and R code are kept in their own source files. However, it's often convenient to bundle code from both languages into a common source file that can be executed using single call to sourceCpp. Multiple R code chunks can be included in a C++ file. 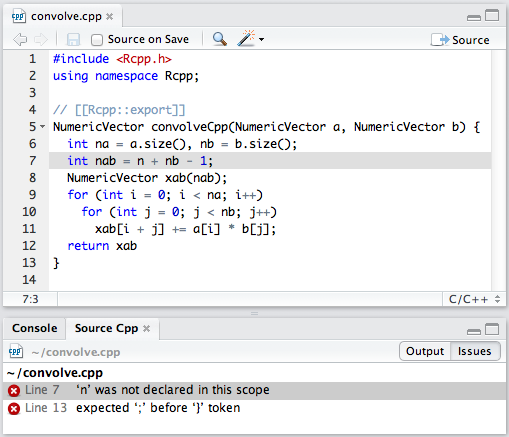 The sourceCpp function will first compile the C++ code into a shared library and then source all of the embedded R code. Completions are provided for the C++ language, Rcpp, and any other libraries you have imported. Thanks to the abstractions provided by Rcpp, the code implementing the Gibbs Sampler in C++ is nearly identical to the code you’d write in R, but runs 20 times faster. RStudio includes full support for Rcpp’s sourceCpp via the Source button and Ctrl+Shift+Enter keyboard shortcut. Diagnostics alert you to the possibility of subtle problems and flag outright incorrect code as early as possible, substantially reducing iteration/debugging time. Note that if you have existing R scripts that you'd like to use as the basis for the new package you can specify them here and they'll be included in the new package. Creating a new project in this fashion will result in a call to the Rcpp.package.skeleton function to generate the basic scaffolding for the package. If you prefer, you can also call this function directly then follow the instructions below for loading the generated package into RStudio. Create a new RStudio Project associated with the package's directory. If the package DESCRIPTION file is located either in the project's root directory or at pkg/DESCRIPTION then it will be automatically discovered. Alternatively, go to Project Options : Build Tools, select "Package" as the project build tools type, and then specify the the subdirectory containing the package's DESCRIPTION file. If you have an existing package which you'd like to add Rcpp to you should consult the Writing a package that uses Rcpp vignette. The most straightforward and reliable approach may be to simply create a new Package w/ Rcpp and then copy the existing packages code and other files into the new package's directory. Unloads any existing version of the package (including shared libraries if necessary). 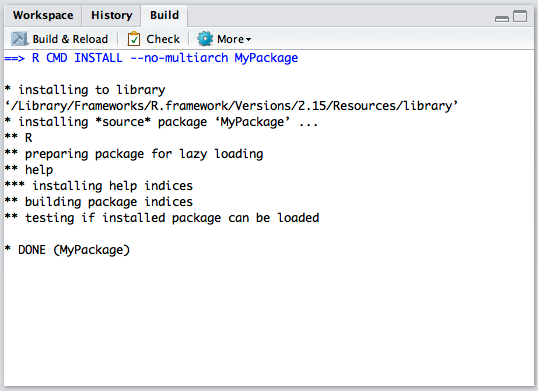 Builds and installs the package using R CMD INSTALL. Restarts the underlying R session to ensure a clean environment for re-loading the package. Reloads the package in the new R session by executing the library function. Note that you can also execute Build and Reload using a keyboard shortcut (Ctrl+Shift+B) as well as configure RStudio to automatically save open source files prior to rebuilding. Custom options for building and checking packages can be specified using Project Options : Build Tools (see Customizing Package Build Options for more details). RStudio will automatically navigate to the first error in the list (you can subsequently view the other errors by double-clicking them). Note that you can switch between the error list view and the underlying build output using the toggle at the top-right of the Build pane. By default the RStudio Build and Reload command includes the --no-multiarch option. This makes re-building the package for iterative development and testing much quicker. Note however that when you execute the Build Binary Package command multiple architectures are built by default. If you prefer to build both architectures during testing and development you can use the Project Options : Build Tools to remove the --no-multiarch option. Note that when changing architecture configurations you should execute the Clean and Rebuild command to ensure the previous configuration doesn't cause errors in the new build. By default RStudio performs incremental rebuilds of packages. C++ files are only recompiled when they change or any header files change. This provides fast turnaround for incremental development. If you need to completely rebuild the package you use the Clean and Rebuild command as described above. If you want to always fully rebuild the package you can add the --preclean option to the Build and Reload command line. This requirement is covered in more details in C++11 section of Writing R Extensions.